When hiring a moving company you will face many questions especially if you have substantial amount of furniture . One of the biggest dilemma is to decide the size of the truck. Options are to go for a bigger truck and do 1 trip or go for a smaller truck and do two trips. Both options have their own advantages and disadvantages. Below are some of the points which should help you in making a calculated decision. Situation : Moving within 15 km radius. Recommendation : Smaller truck with 2 trips. In short moves travel is minimal, most of the time is accounted for loading and unloading plus the extra half an hour for the second trip. 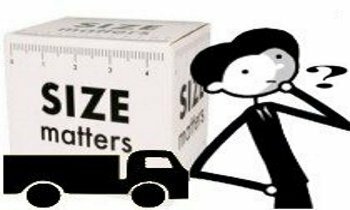 Smaller trucks can be loaded quicker than a bigger Truck, because you do not have to stack everything precisely to fit. So the extra time for travel is compensated by quicker load . The truck is smaller and easier to park especially in moves around the city and easier to maneuver in the tight city spaces and corners. Hourly rate for the smaller truck is generally lower than a bigger truck, and will definitely save in cost. Situation : Moving beyond 15 km radius. Recommendation : 1 trip is recommended on a bigger truck. In long distance moves, only one trip option is feasible. Two trips are not recommended because it will take longer in travel time and also extra fuel costs.